"The Highest Quality Sill Pan Flashing System Available"
The World's Most Innovative Window & Door Sill Pan Flashing System ! Superior Weatherproofing Protection For Builders & Homeowners ! Very Easy To Install ! Our PVC sill pan flashing kits are the perfect solution. This patented window and door sill pan flashing system has provided the construction industry with the best sill pan on the market. With over 2 million sold our sill pan flashing kits are impervious to rust, corrosion, galvanic corrosion, electrolysis, and corrosive coastal areas. Sill pans installed in your home help prevent many long-term problems associated with water leakage around the sills and framing of your windows and doors. These problems include buckling floors, stained carpets, and rotting. 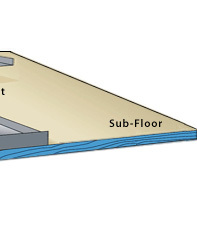 Water leakage in these areas is common, but can be prevented by the simple installation of this cost effective sill pan during construction or remodeling. For builders and contractors installing a sill pan under doors and windows provides security against costly callbacks associated with leaking windows and doors. Compare the price of our sill pan products to the cost of a new floor, carpet, wall or window and you will be convinced of their benefit. This is the finest sill pan flashing system available for exterior windows and doors both residential and commercial. It has been specifically designed to prevent water damage from window and door leaks. Injection molded of high impact polymers that will not deteriorate over time, the product has been time tested for over 22 years with over 2,000,000 sold and not one reported leak. Inexpensive and very easy to install with it's simple design that is much more user friendly than comparable products on the market today. The three piece telescoping design allows the installer on-site adjustability to fit all rough openings and is easily bonded together in the field with P.V.C. cement. Easy installation with an efficient multiple-piece adjustable design (three pieces). Patent pending weep areas that direct ambient moisture away from areas that would be susceptible to water damage. Durable weather resistant injection molded high impact polymer plastic material. Sill pan flashing kits are available in widths that will fit any window or door. To determine which sill pan fits your window or door simply measure the jamb width or on sliding doors measure from the nail fin back to the interior edge of the door sill. The kits provide a center piece that is often wider than your rough opening and this can be easily trimmed with a hacksaw or a pair of tin snips for a precise fit. The bonding area requires at least a 2" overlap at each joint for proper bonding. 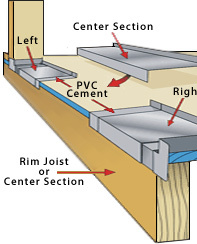 PVC Cement is the only adhesive or bonding agent that can be used. Once the door is installed, the sill pan flashing is locked into place by the door's sill and does not need to be glued into the rough opening. We offer discounts based on volume pricing. Enter the appropriate coupon code when completing the checkout process. Use coupon code SPFK10 for 5% off a $100.00 or more purchase. Use coupon code SPFK20 for 10% off a $250.00 or more purchase. Orders or individual packages include left and right end caps, center section, PVC cement, application brush, and installation guidelines. The sill pan flashing system is available in 7 different depths to accommodate most window and door applications in either 2x4 or 2x6 construction. They are not visible after installation. 118 Series are used primarily for aluminum and vinyl windows. 238 Series are used primarily for vinyl windows. 314 Series are used primarily for vinyl patio doors. 358 Series are used primarily for aluminum patio doors. 418 Series are used primarily for windows and doors. 4916 Series are used primarily for windows and doors. 6916 Series are used primarily for windows and doors. We offer a series of volume or quantity discounts on purchases over $100.00 for all of our sill pan flashing kits. Simply enter the coupon codes in the "Coupon Code / Promotional Code" field that is included on our checkout pages and the appropriate discount will be applied to your purchase. For higher quantity pricing please call us at 855-568-8586.